It is a new week and that means another week of updates and patches! There is more coming to Operation Grand Heist in the near future, but the patch that went out today was largely focused on PC, general fixes, and some small changes. In addition to all of that, this comminity update has some CWL news in it. Attachments can now be moved from one weapon directly to the other with the Middle Mouse Button. Attachments can now go from Inventory or Stashes directly to a stowed weapon with the Middle Mouse Button. Players can now "Swap and Attach" weapons found in a Stash with the Middle Mouse Button. Players can now equip consumables with the Middle Mouse Button in the Inventory. Added a "Use Consumable" keybind which allows using consumables without opening the Inventory. Pressing the button will use the currently equipped consumable. Added a new element to the HUD to let players know which consumable is currently equipped. Added the "Next Consumable" keybind which changes the player’s equipped consumable to the next in your inventory. Jump into a match and let us know what you think! Today’s update also fixes an issue that temporarily increased the player collision boundaries for teammates in Multiplayer, as well as a crash that could occur when frequently switching between modes at the main menu. From all of us at the studio, huge congratulations to Luminosity for coming out on top and taking it all in the CWL Fort Worth Grand Finals over the weekend, along with Splyce, Team Reciprocity, and 100 Thieves rounding out the Top 4! Congrats are also in order for FaZe Black, who won the Open Bracket Grand Finals against Mindfreak on the main stage on Sunday. With 16 Pro League teams and over 180 amateur teams duking it out all weekend long, this one was one for the record books. Big thanks to our partners at the Call of Duty World League and MLG, our incredible casters, all of the fans watching at home, and the thousands of fans who came out to party with us in Fort Worth, making this one of the highest-attended CWL open events of all time. Let’s do it all over again next time at CWL London, May 3-5. 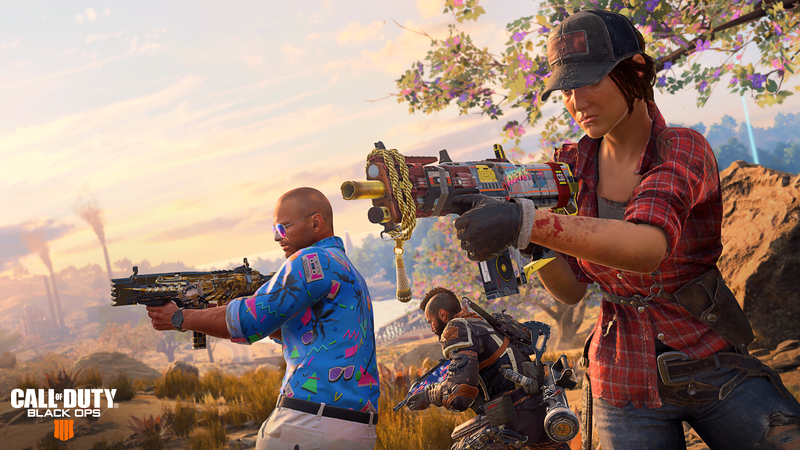 PC 1.14 update now live with PC-exclusive additions, including new Blackout inventory management options, GPU optimization, stability fixes, and more. Updated friendly hitmarker and added improved Hardpoint stats in World League Hub. Fix for increased friendly player collision boundaries in Multiplayer. Fix for a crash that could occur when switching between modes at the main menu. Stability fixes in Multiplayer and Zombies. Fixed a crash that could occur when frequently switching between modes at the main menu. Addressed an issue causing increased player collision boundaries with teammates. Addressed various issues that could occur when parking the Hawk immediately after deploying it. Fixed a crash that could occur when using Mesh Mines in certain situations. Added improved stats in Hardpoint. Fixed a crash that could occur when setting Custom Option “Damage Multiplier” under enhanced AI. Community Admin Note: Patch Notes can be found in their respective sections of this community. How about fixing the objectives challenges so the accrue progress when playing league play? "Multiplayer Challenges now properly track while playing in League Play Events."